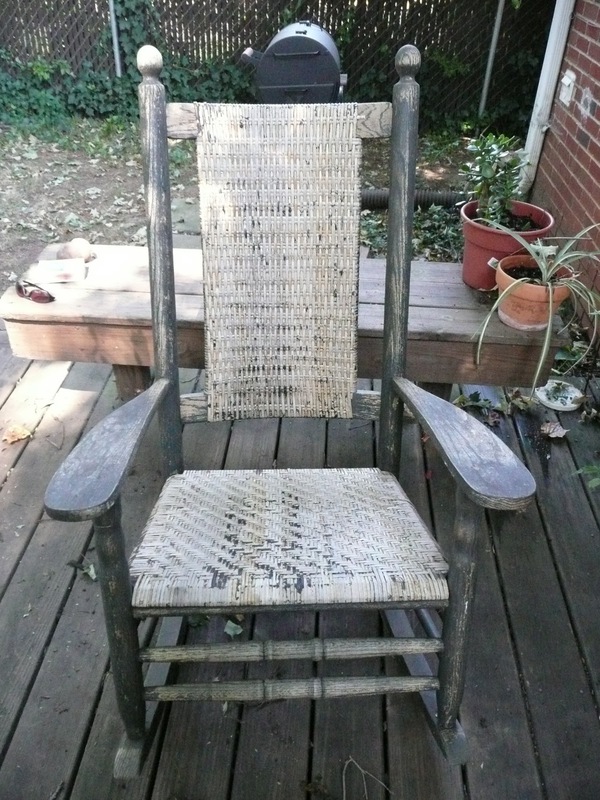 What do you do with a broken rocking chair found by the road on trash day? Transform it of course! 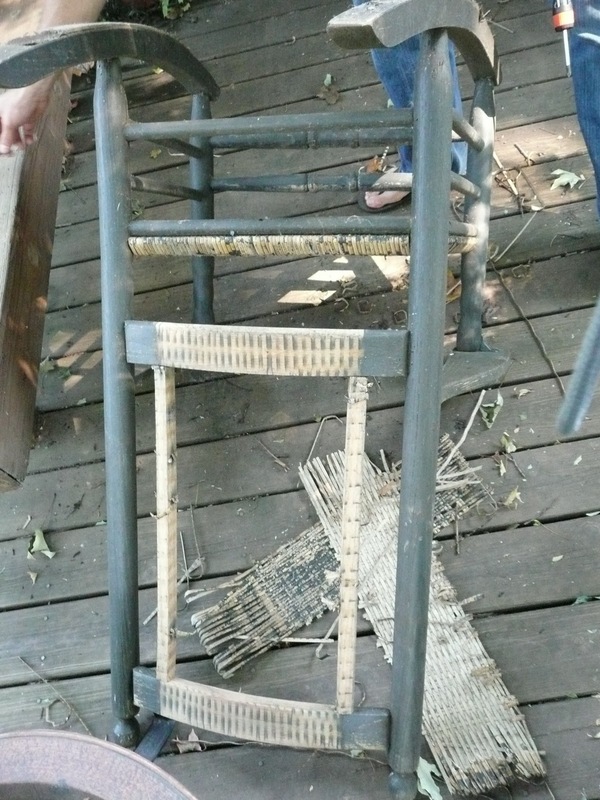 We removed all the rotted caning. 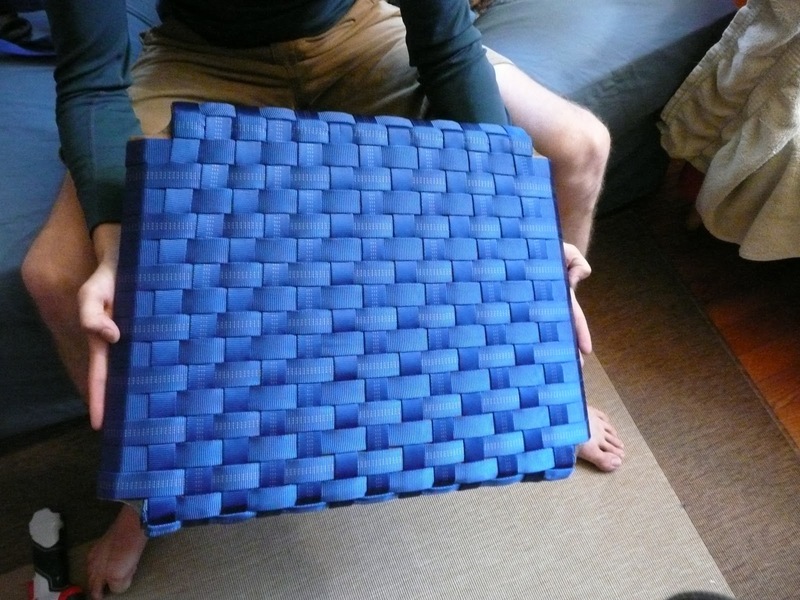 The new seat is made from blue webbing. 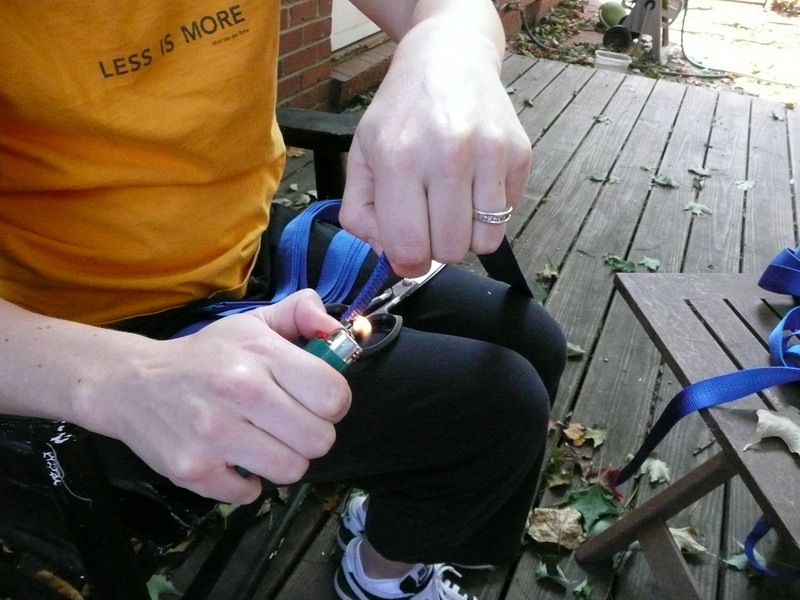 I used a lighter to melt the ends of the webbing. 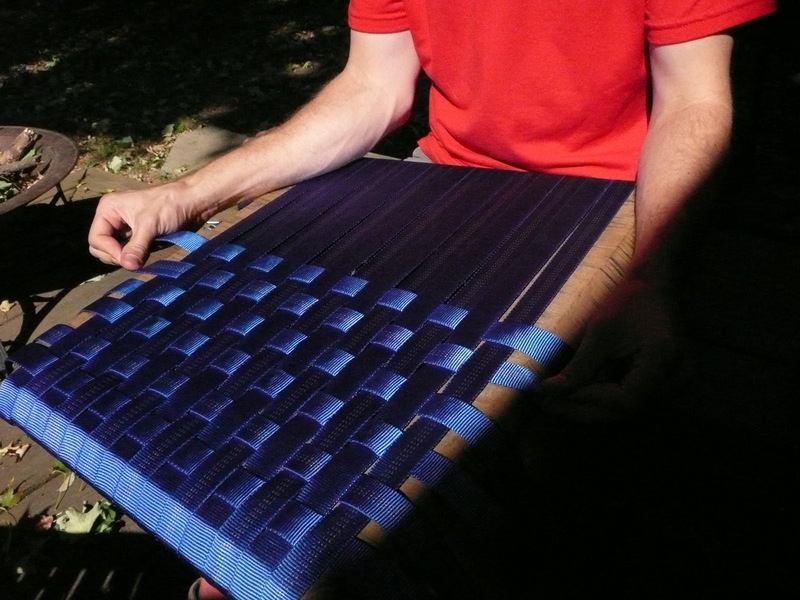 Eric wove the webbing for the seat. Finished front side of the seat. Back of the finished seat. 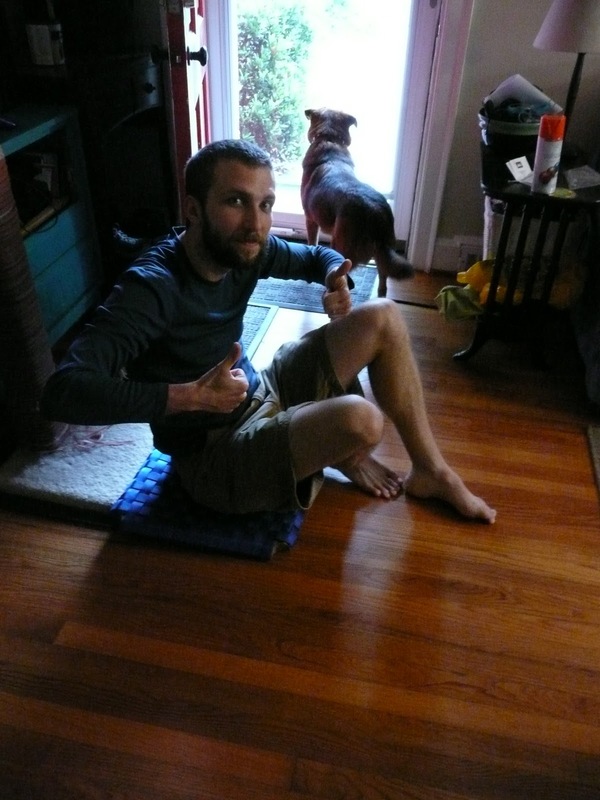 Eric testing the strength of his weaving. 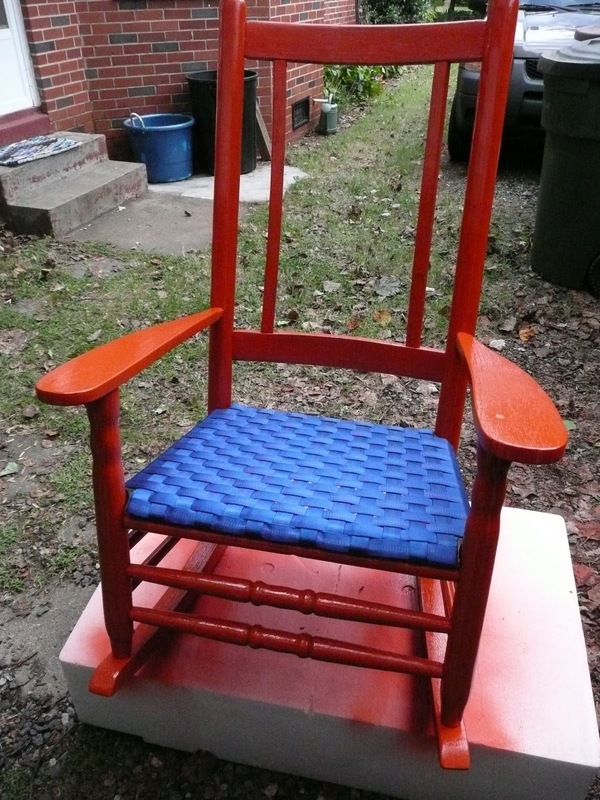 Last coat of orange paint and the seat is installed. 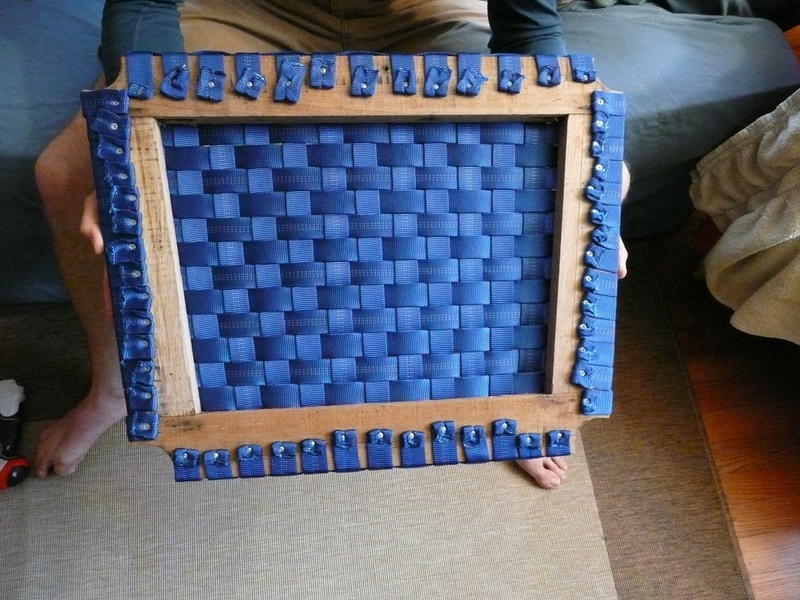 The finished chair with black and blue webbing for the backing. 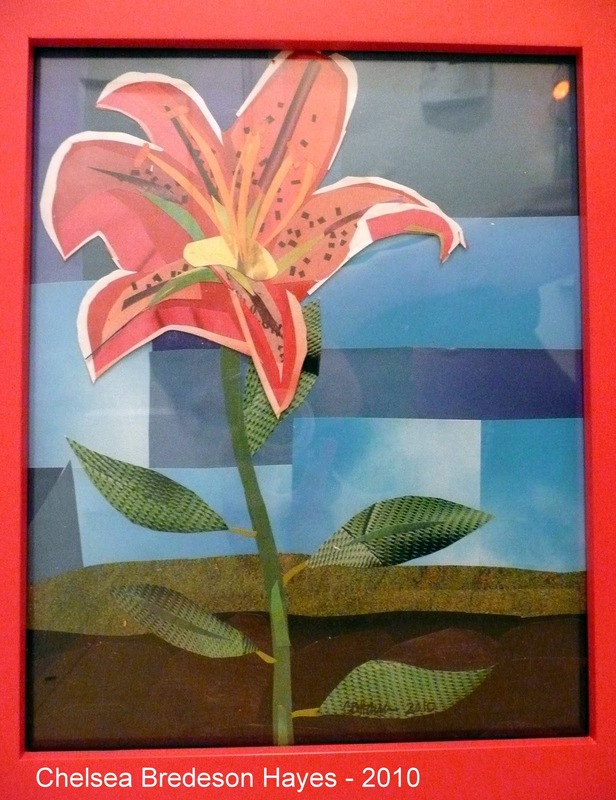 Lily, collage on paper, 2010. This is my newest collage, as of tonight. This is not the best shot, however, it does show off the layers nicely. I plan on taking another photo tomorrow in daylight. Whew! Finally got a project done that has been lingering for a while now. With school keeping me busy during the week, this is quickly becoming a weekend only blog. I found a chair by the side of the road on trash day before school started, back in August. I was biking with Eric to work and then the plan was for me to ride home. I was on my way through neighborhood streets when I found a lovely chair. I thought perhaps I could ride and carry it, but I am not quite as talented as Eric on a bike. So I raced home, got my car and drove back as quickly as I could. The chair, I discovered, had nice bones, but a funky odor. 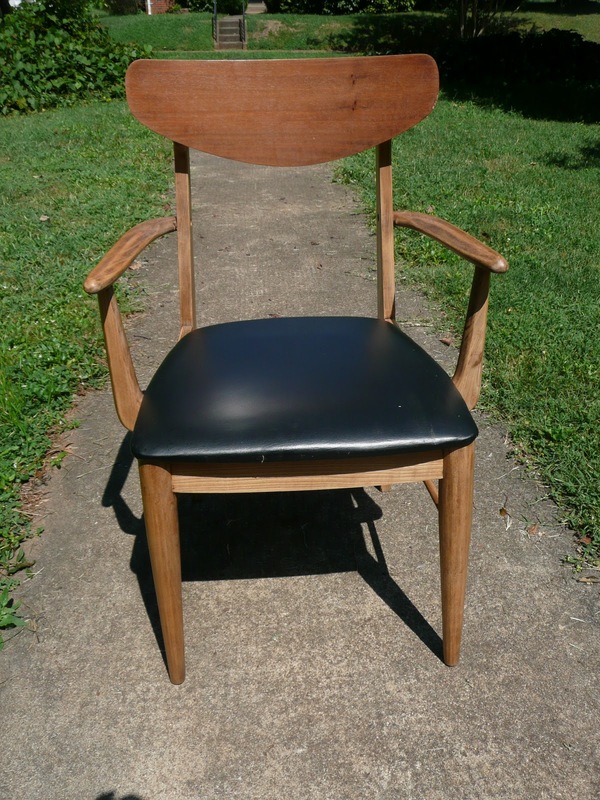 It was clearly a Danish design style chair, and despite all that I have learned on Antiques Roadshow about refinishing, I wanted to update it to suit my home and its non-smoking atmosphere. I started by taking the seat off of the chair. 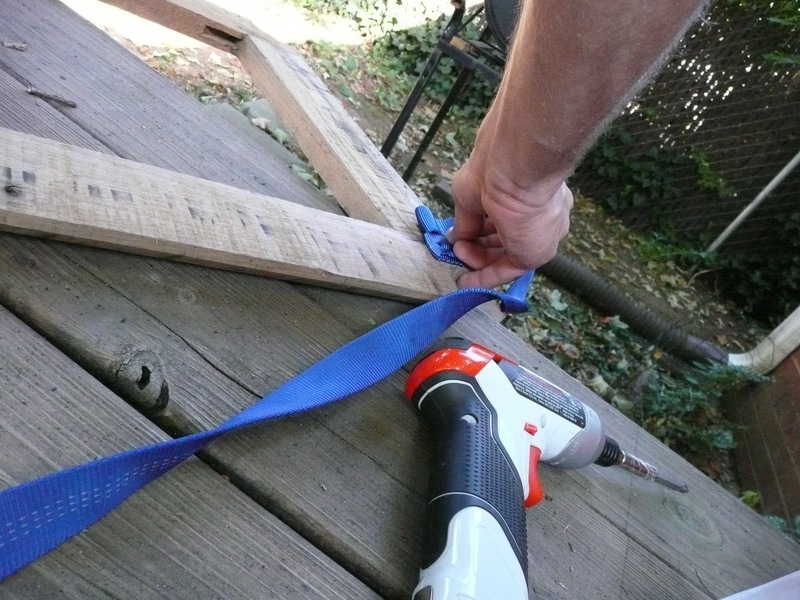 Then, I continued to sanding the chair by hand, quickly switching to an orbital sander. This made the stripping of the finish an easy evening job. Eric and I took turns doing this while grilling dinner one night – that way neither of us had to lose all feeling in our hands. Masks and eye protection are a must for this step! 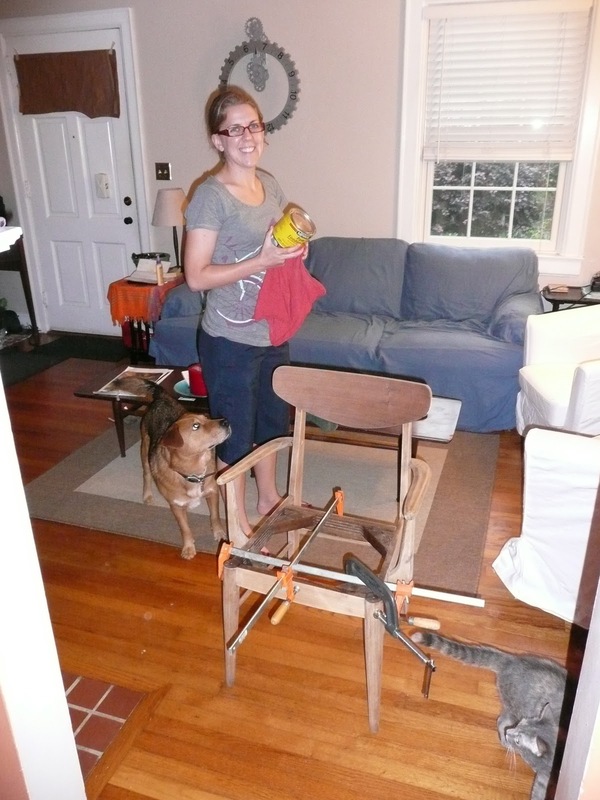 After sanding, we glued the chair with wood glue and clamped it together. 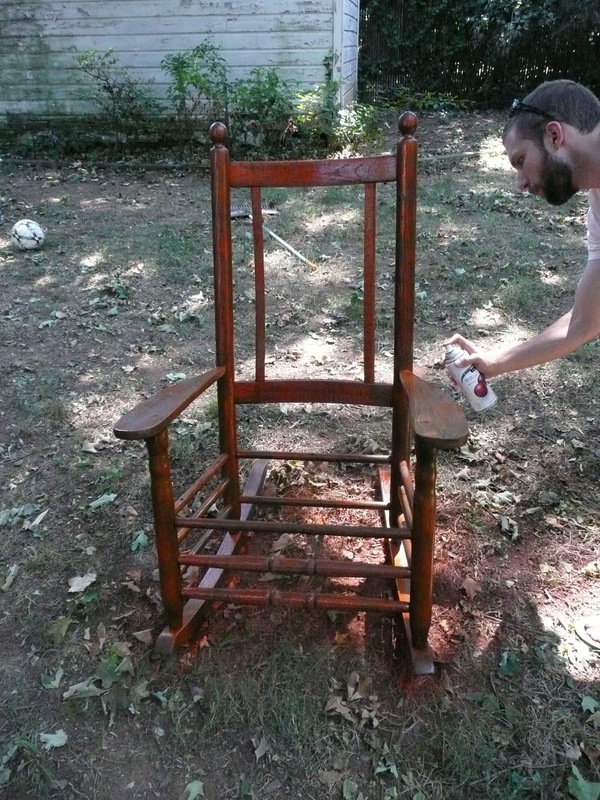 I wiped the entire chair down with a dry rag and used a wax finishing paste to give the chair a nice clean finish. I like the finishing wax because there is no dripping whatsoever. The chair clamped and in the finishing stage. 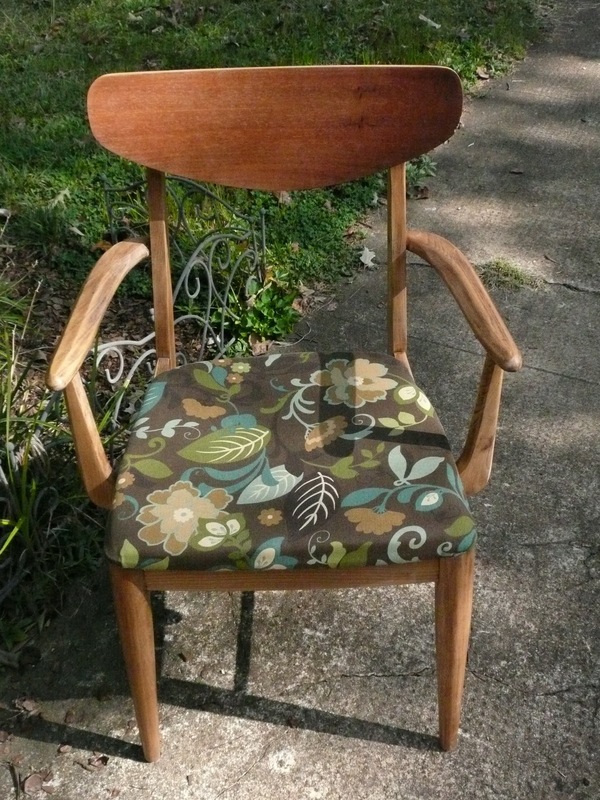 Chair with new finish, still the old cushion. The next step was to pull off the vinyl fabric of the cushion. I tore it off to find squashed foam underneath, so I replaced that with simple foam from JoAnn Fabrics. While there I found a remnant cotton upholstery fabric that matched too many things in my house too well. The remnant bin is maybe my favorite section of the entire fabric store. I traced my foam with the wooden seat, cut it out to fit perfectly, laid my seat on top of my fabric, stapled it all together, and lastly used a rotary cutter to trim excess fabric. I even had enough left over to make a cute pillow. My fabric choice. 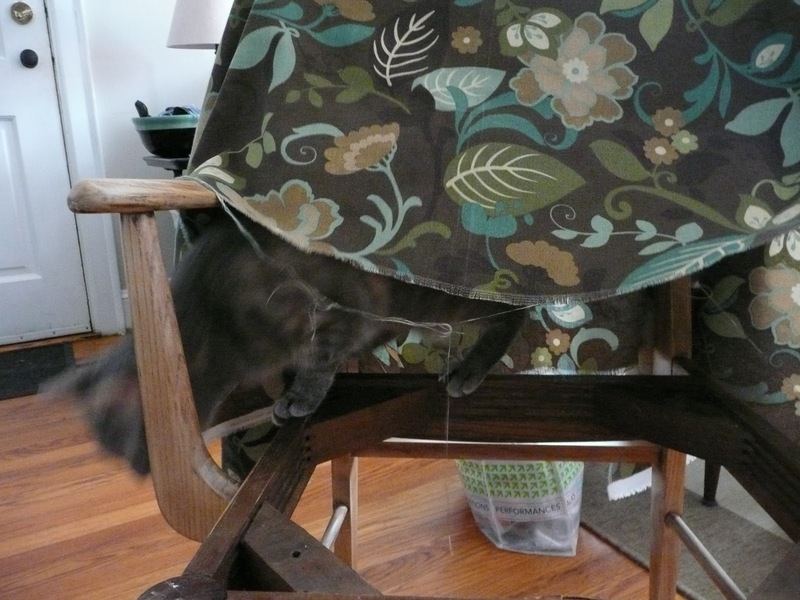 My cat liked the tent it made on the chair. While there I found a remnant cotton upholstery fabric that matched too many things in my house too well. The remnant bin is maybe my favorite section of the entire fabric store. I traced my foam with the wooden seat, cut it out to fit perfectly, laid my seat on top of my fabric, stapled it all together, and lastly used a rotary cutter to trim excess fabric. 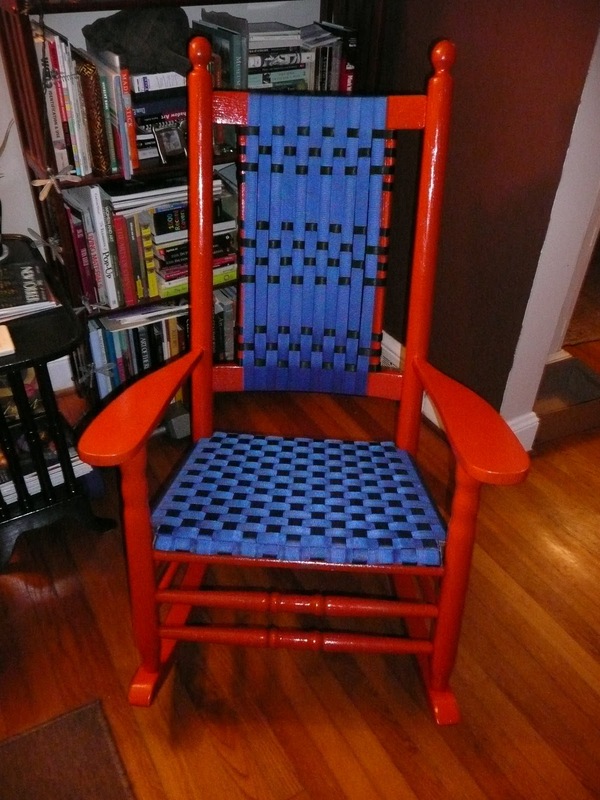 The finished chair. The print reminds me of the mid-century Hawaiian designs. It works perfectly with my brown, green, and blue living room or bedroom. 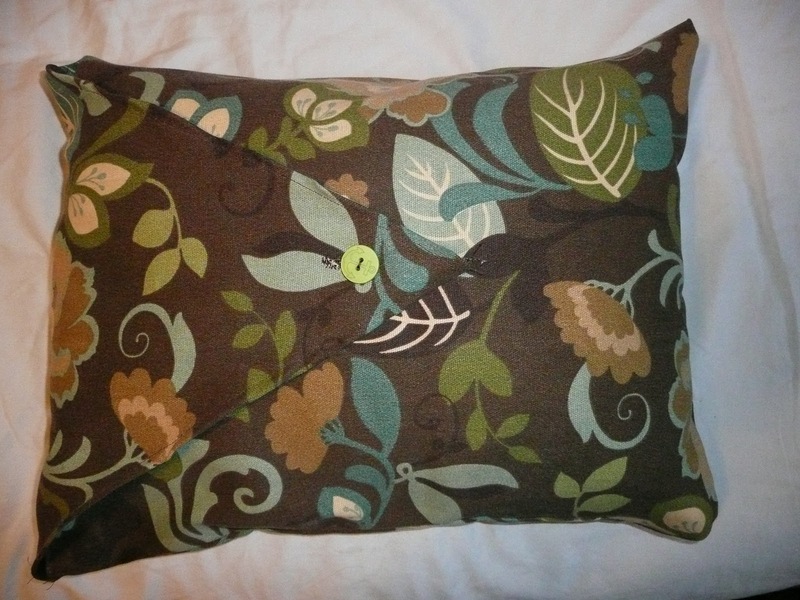 I even had enough fabric left over to make an envelope style pillow, complete with a green button.